The unnamed dual-core 10.1-inch Toshiba Android tablet that we got to play with at CES this year has oddly remained anonymous for an extraordinary amount of time - in fact, we still don't really know what its final name will be. An earlier rumor suggested it could be called "Antares," and today's freshly discovered Newegg pages curiously neither confirm nor deny that name, simply listing its 3 variants as ANT-100, ANT-102, and ANT-104. Could ANT be short for Antares? Sure. Could they both be just internal codenames? Just as well. All tablet variants are equipped with Wi-Fi and aren't tied to a specific cellular provider, providing a few sweet spots for those who don't need the full 32GB of memory (I'm having trouble seeing the XOOM selling well after this at all at $600). 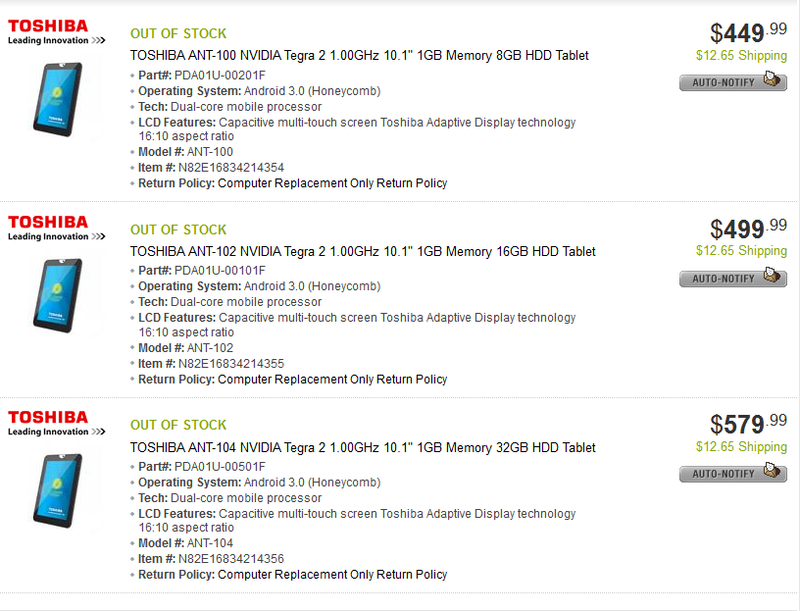 Considering these Toshiba tablets have a full SD card slot, throwing in a $50 32GB class 10 card should provide plenty of storage without breaking the bank. What's that? Did you see it? That's right, this slate has a full-size USB port.